This top is a stunning design, a feeding and maternity singlet style top with overlay that hides discreet feeding openings. 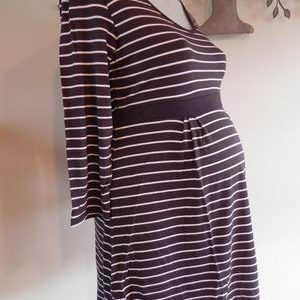 New with tags, by Ninth Moon, this top is so flattering, perfect to be worn during and after pregnancy. Size 8 would also suit size 10. Plenty of stretch in the soft fabric. Be the first to review “NEW Coral and White Striped Feeding Singlet with Overlay” Click here to cancel reply.